West Ham 1-2 Chelsea: Your thoughts on a massive result for Antonio Conte's Chelsea side tonight? With goals from Eden Hazard and Diego Costa, Chelsea took a massive step towards the Premier League title tonight with a 2-1 victory at The London Stadium and according to the Bet365 app, Chelsea are now favourites to beat Manchester United on Monday night in the FA Cup. Arguably, heading into the game knowing that Tottenham, Manchester City and Liverpool had all won this weekend to close the gap to us, this was the biggest game of our season so far having lost to the Hammers earlier in the season in the League Cup. It was important that Chelsea delivered a good performance this evening to make a statement and send out a message to our title rivals. In saying that, I would have taken an ugly win, a lucky win or even an undeserved one as long as we took an all important three points because tonight ahead of kick-off, that was all that mattered. Antonio Conte delivered a surprise with his team selection, naming the same side that started our last game against Burnley with Cesc Fabregas playing next to N’Golo Kante in the heart of our midfield with Nemanja Matic on the bench. I say it was a surprise because knowing how important the game was, with West Ham at times likely to look to push men forward in support of Andy Carroll up front, we would need that addition protection in front of our back four. Within ten minutes it was clear that we never need to worry because we have Kante in our midfield who put in another 8/9 out of ten once again. Even Cesc Fabregas covered the ground this evening and put in an excellent shift with and without the ball which was good to see. If anything, Conte had got his team selection spot on and only chose to deploy Matic into midfield with a tactical change to a 5-3-2 formation to shut up shop and close the game out halfway through the second half. Chelsea started the better of the two sides in the first half, popping their passes about and dominating possession without really causing the home side any problems. To their credit, West Ham then had their period of play dominating the ball, knocking it about by as with Chelsea, not creating much to worry about. It was almost as if the home side lost their concentration, got carried away with how much possession they had, that it cost them the first Chelsea goal from a stunning counter-attack. Chelsea had given away a needless free-kick, thirty yards out which was blocked by our defensive wall. The ball came out to our left hand side and rather than lump the ball into the box looking for Andy Carroll, Mark Noble decides to try and play the ball down the line on our left hand side to which Kante has read exactly what he is looking to do and steps in front of their player to win the ball. He then gives it first time to Hazard who, along with Pedro, are already on their bike. Aaron Cresswell is the only man left defending at stage with two of his team mates desperately looking to get back to assist him. 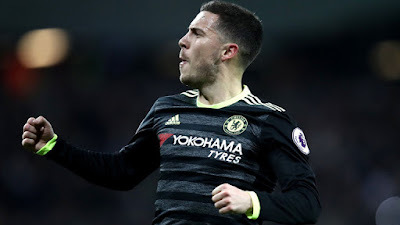 With that, Hazard plays the ball square to Pedro and continues his run, Pedro flicks the ball passed the defender first time with his left foot and Hazard looks to be in on goal. He cuts across the goalkeeper and those defenders trying to get back to slot the ball into the net to make it 0-1 Chelsea (The goal was timed at 11.4 seconds from the moment we won the ball deep in our own half to the moment the ball crossed the goal-line, it was such a quick and decisive counter-attack). West Ham continued to try and work the ball into dangerous areas looking for Andy Carroll and for the most part, our back three of Azpilicueta, Luiz and Cahill dealt with his threat fantastically well. They were assisted by Alonso and Moses either side of them with Moses giving us his best defensive display of the season so far. You could see that Chelsea were well drilled, well prepared and have worked on dealing with balls being pumped into the box leading up to the game. Our second goal early in the second half was another demonstration of it as we had a corner wide left. Marcos Alonso, who had a good game, took up a position against Andy Carroll who had taken up the Didier Drogba defensive position around the near post. As the ball came into the box, Alonso made life difficult for Carroll and he was taken out the equation. 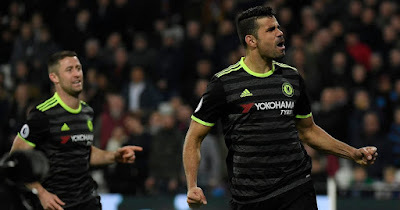 The ball was flicked on by a misjudged defensive header straight to Diego Costa who had drifted into space on the six yard line and he bundled the ball home to make it 0-2 with ten or so minutes of the half gone. Chelsea were well in control now and if anything, we should have really had a go at West Ham tonight with that being my only criticism of the side. We opened them up with some great interplay during the game but didn’t show any real conviction. If we had done, we would have scored. 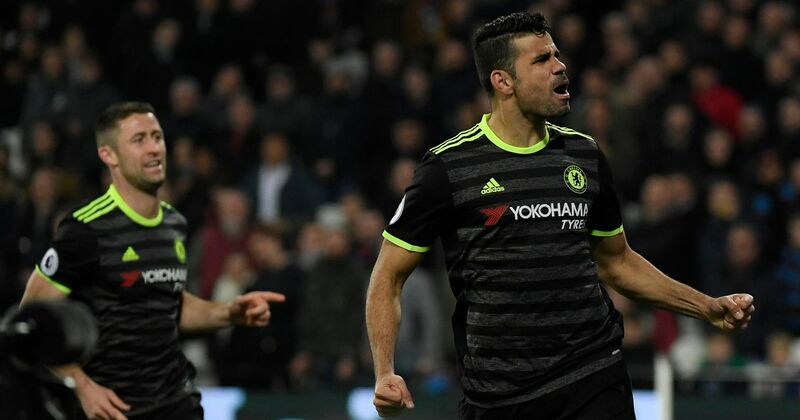 Diego Costa came closest to adding a third but for a fantastic reaction save from Randolph in goal for West Ham. As mentioned previously, Matic came on for Pedro on 65 minutes, Willian came on for Eden Hazard ten minutes later with Kurt Zouma coming on for Victor Moses shortly after. Again we created some chances with notably Fabregas blazing the ball over the bar late on. 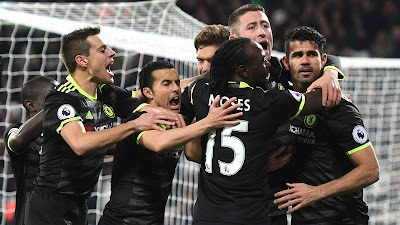 West Ham struck in injury time to ruin another clean sheet for Thibaut Courtois through some sloppy defending but the game was won and Chelsea restore their lead in the title race to ten points once again (Manchester City can move into second place, eight points behind with a victory against Stoke on Wednesday). Make no mistake, after some big wins for the chasing pack, Chelsea needed to win this one more than ever to send out a message. Chelsea delivered a win, a massive three points and a totally professional performance!